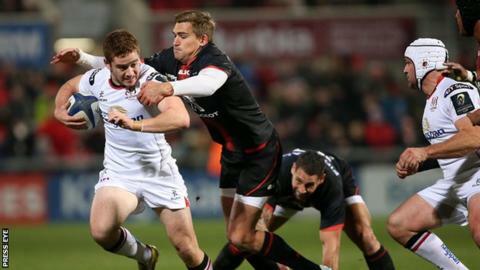 Ulster breathed life into their European Champions Cup campaign with a hugely impressive 38-0 bonus-point win over French outfit Toulouse in Belfast. The sides meet again in the second of back-to-back fixtures on Sunday, with the four-time winners keen to exact revenge for a humiliating defeat. The Irish province lie second in their group, nine points behind Pool 1 leaders Saracens, with a game in hand. BBC Sport NI analysts Ryan Constable and Maurice Field offer their thoughts. "Having already lost at home to Saracens, it's non-negotiable that Ulster need to win against Toulouse on Sunday. "French teams are a totally different proposition at home and they take a completely different mindset into their games. The Toulouse supporters will demand more from their side than they saw in Belfast and the players will be hurting. "Friday night's result means nothing in the context of European competition if Ulster don't back it up with another victory. "If you win three games you have no chance of qualifying for the quarter-finals but if you win four it gives you chance, although it's not a guarantee. "The result at Kingspan Stadium offers some real ambition as to what Ulster can achieve but it will be a different Toulouse team that Ulster will line up against this weekend. "The back-to-back round three and four fixtures are usually intriguing and I can remember an instance against Leicester when Ulster enjoyed a convincing victory at home and then the scoreline was almost reversed a week later. "The display against Toulouse was one of the most comprehensive performances I've seen from an Ulster team against that quality of opposition. "The French team were outplayed in every facet of the game and there was an overwhelming sense of urgency and intensity with which Ulster went about their business. "A result like that can do a lot for Ulster looking ahead to the future and we are seeing the evolution of this squad to a new level. "You have a core of indigenous talent who take a real pride in the jersey and if you sprinkle a couple of world class players into the mix, then you have the potential for the team to become a potent force in Europe. "It's important not to get carried away by one performance, albeit a phenomenal one, but if they can get their tactics right, the forwards execute their set-pieces in the right fashion, the defence remains resolute and they can be dynamic in attack, then there can be a renewed enthusiasm about what Ulster can achieve this season. "Without a win this weekend however, they are out of European competition for this season." "I don't see how Toulouse can bounce back from a hammering like that, especially within the space of a week and taking into account the manner of the defeat and the fact that they didn't manage to score a single point. "They tried to create things and pressed and pressed on the Ulster line late on but never got anywhere as the Ulster defence was immense. "Conceding five tries will leave their confidence shot and it will be such a major psychological blow. On the other hand, there is a renewed sense of optimism from an Ulster perspective. "Also, Toulouse have their star performer, Louis Picamoles, out injured and they can't afford to lose a player of that stature. "Ulster simply didn't allow them to play in Belfast - they completely stifled them with an outstanding display of commitment in defence and attack. "The platform was set by the front five and Ulster will look to go to France and play in the same way, which is a different style of rugby to that you find in the Pro12. "The last 20 minutes against Saracens was particularly gruesome viewing but Friday night's win was the most complete performance I have seen from an Ulster team in the professional era. "They were immense and inventive and you could see the stamp of Les Kiss (Director of Rugby) in the way the backs were running from deep with creativity. "The players really put their bodies on the line and were sharper and faster than the opposition. This was against a team who are currently at the top end of the Top 14. "Ulster must win this weekend but bonus-point victories home and away against Oyannax are crucial. They are the whipping boys of this Pool and of the Top 14 at the moment." Ryan Constable and Maurice Field were speaking on BBC Radio Ulster.